Alice is a Jupyter Notebook user. Alice prototypes data access, modeling, plotting, interactivity, etc. in a notebook. Now Alice needs to deliver a dynamic dashboard for non-notebook users. Today, Alice must step outside Jupyter Notebook and build a separate web application. Alice cannot directly transform her notebook into a secure, standalone dashboard application. Alice authors a notebook document using Jupyter Notebook. She adds visualizations and interactive widgets. Alice arranges her notebook cells in a grid- or report-like dashboard layout. Alice one-click deploys her notebook and associated assets to a Jupyter Dashboards server. Bob visits the dashboards server and interacts with Alice's notebook-turned-dashboard application. Alice updates her notebook with new features and redeploys it to the dashboards server. 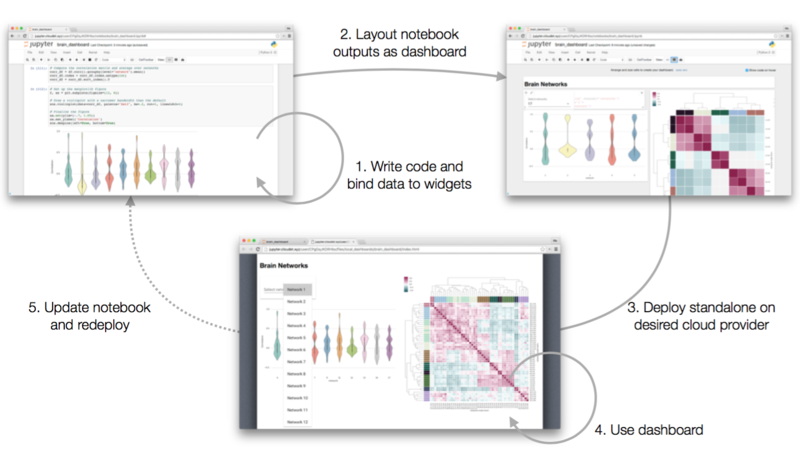 The ecosystem of widget and visualization libraries for Jupyter Notebook covers step (1). The dashboard layout extension handles step (2). The other incubating projects in the Jupyter Dashboards effort, namely the dashboard bundlers and dashboard server attempt to handle the remaining steps (3) through (5).